Fortunately, the Schumachers found Thomas Lawrence, an architect who doesn’t mind providing couples therapy. “Tom was very understanding and good at melding our visions,” says Kirk. The Schumachers did agree on one thing: They wanted a small house on the 1-acre lot. Lawrence was happy to comply. “To create a nice compact house requires more creativity than designing a big one,” he says. The resulting home squeezes a great room, a master suite, and bedrooms for the couple’s son and daughter into just 2,000 square feet, with a 500-square-foot loft over the garage for guests. In addition to a small footprint, the couple also wanted their home to be environmentally friendly. On-demand hot water, electric in-floor radiant heating, and ceiling fans in lieu of air-conditioning keep energy usage down. 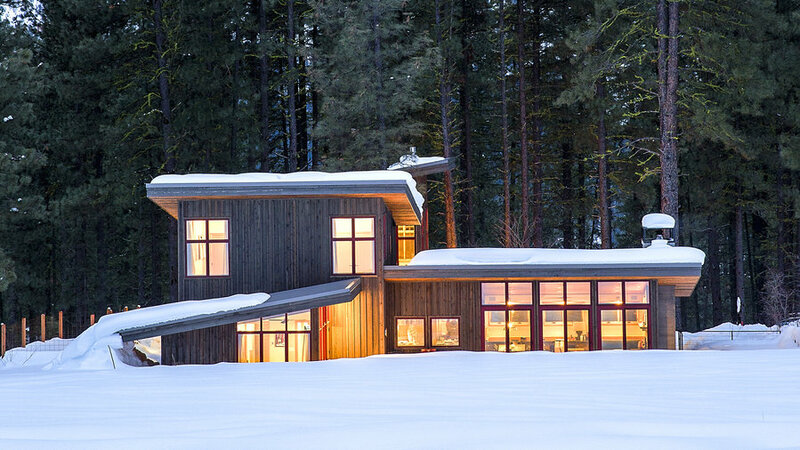 To help modulate the area’s temperature extremes, Lawrence also designed a super-insulated roof. 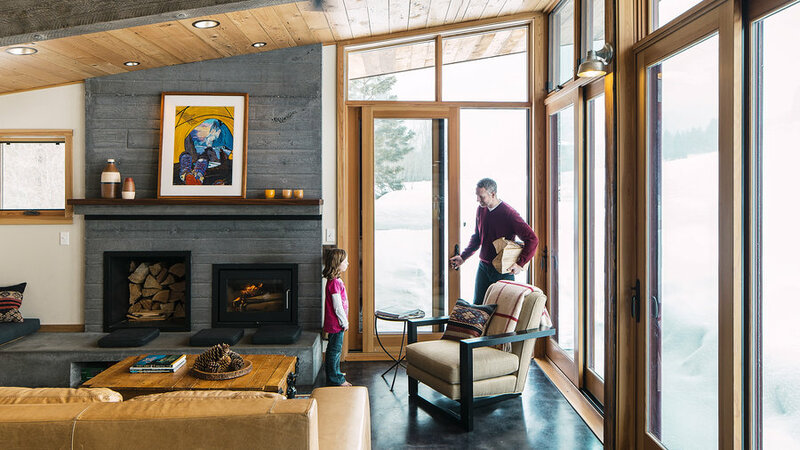 The interior reflects the couple’s shared love of the outdoors—and blends their competing tastes. 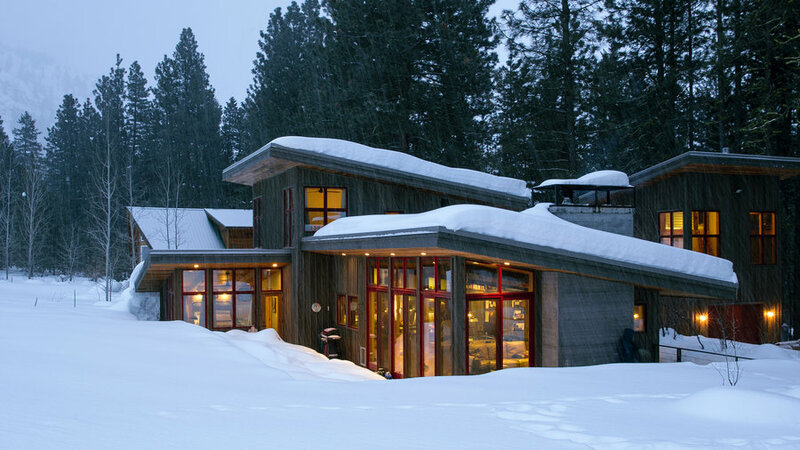 Large windows and glass doors seem to bring snowdrifts and fir, cedar, and aspen trees into the rooms. In quirkier fashion, the couple decided to sub climbing hangers (the metal bolts they frequently use for rock climbing) for drawer pulls. “They’re way more affordable than traditional pulls, and you can open a beer bottle with them!” says Kirk. Beer or not, the adjoining kitchen and living room is party central. “We wanted the rooms open to one another so we could dance around with the kids,” Jen says. 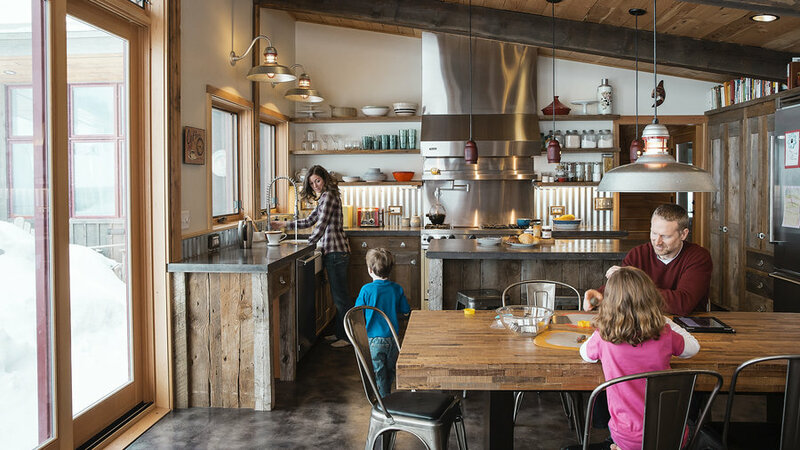 Jen’s rustic style prevailed through elements like reclaimed barn wood ceilings, corrugated metal wainscoting, and pendants made from recycled fuel tank lids. Contemporary fixtures and poured-concrete floors, however, keep the vibe industrial, not country-kitsch. “The modern aesthetic underneath everything makes the rustic materials stand out more,” says Lawrence. It’s a middle ground that lets both Jen and Kirk feel like they came out winners. ARCHITECTURE: Thomas Lawrence, Seattle; lawrencearchitecture.com. The home’s shed-style pitched roof is a contemporary version of a traditional shape. Lawrence designed a combination of glass doors and fixed-pane windows, providing big views at less cost than expanses of solid glass. For the covered walkway between the house and the garage, left, Lawrence combined a modern form with traditional board-and-batten siding. Through the door, a stairway leads up to the guest quarters over the garage. 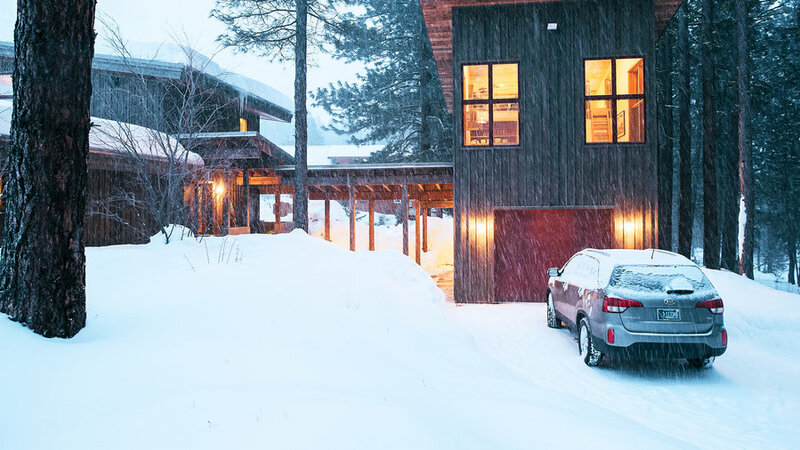 Above, the insulated-metal garage door—more economical than wood—is a splash of color against the house. 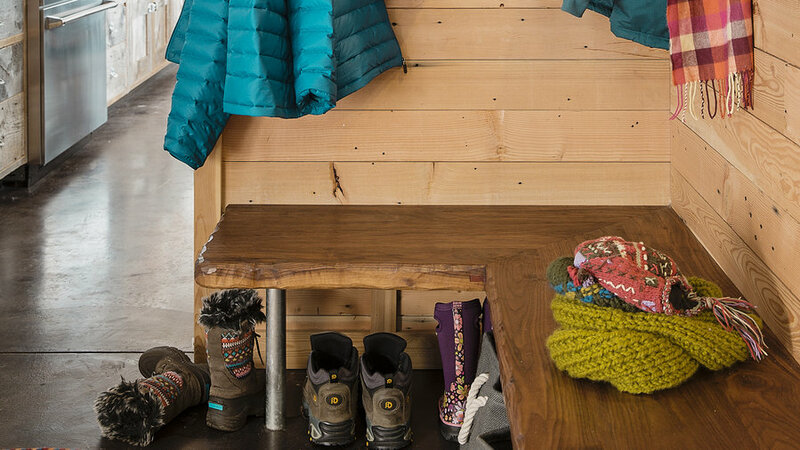 Unfussy hardware topped with live-edge wood creates a banquette-style bench in the mudroom just off the kitchen. Baskets beneath the bench help corral mittens and hats. A board-formed concrete fireplace features an efficient Morsø wood-burning stove and a handy niche for storing wood. 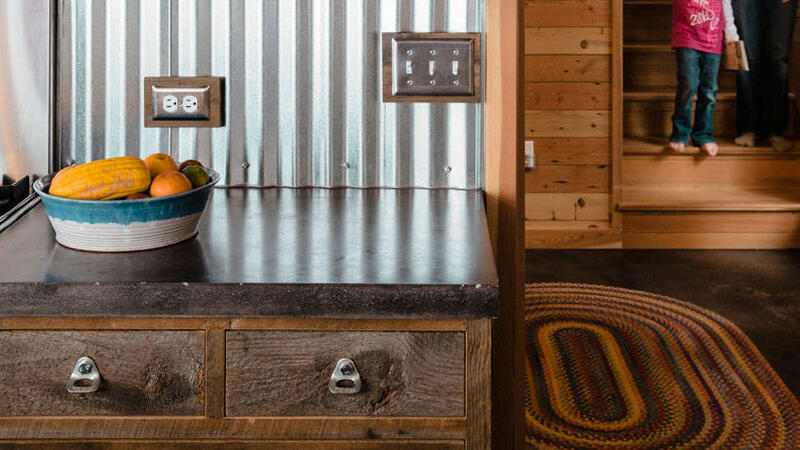 The concrete floors were dyed to create a mottled appearance and to complement the reclaimed wood of the coffee table (fashioned from a railroad car) and the cabinets in the adjacent kitchen. 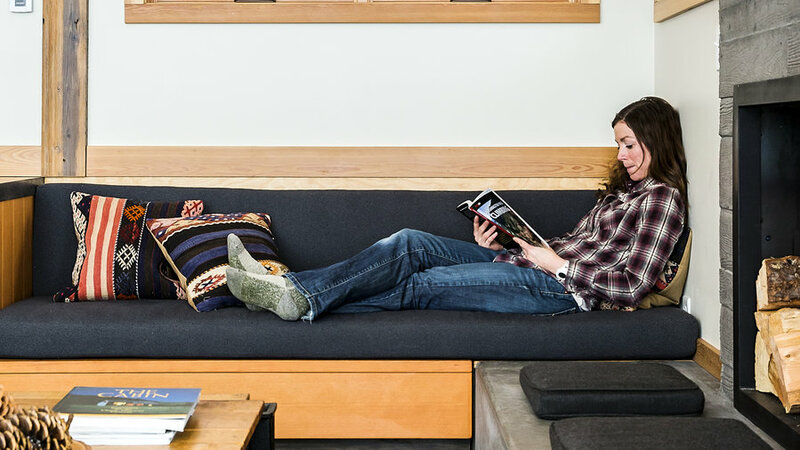 Lawrence installed a custom bench in the living room, left, that pulls out into a twin bed. Pushed back in, it’s a cushioned seat. 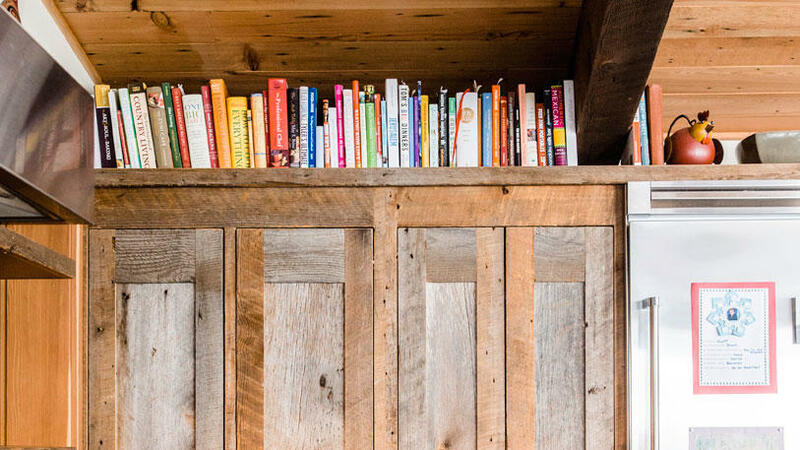 The reclaimed wood cabinetry was also built by Schwab. “I’d never used barn wood that had been weathered for 100 years and simply covered it with a clear finish, but I think it turned out great,” Lawrence says. 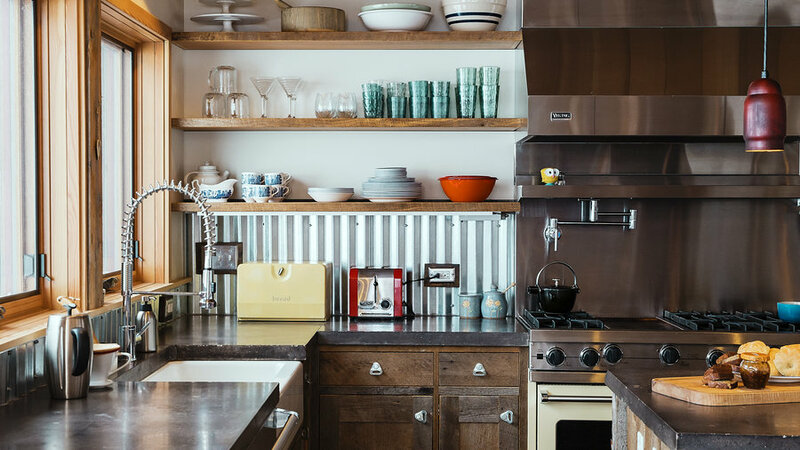 Inspired by a room with corrugated metal siding in an old issue of Sunset, the Schumachers chose the affordable material for the backsplash. The wooden shelves have hidden supports drilled into the wall studs for a cleaner look. “They’re high-tech rustic shelves,” jokes Lawrence. Poured concrete countertops keep the vibe industrial. Custom built-ins make the most of a small space, including this reach-in pantry by woodworker Cliff Schwab. 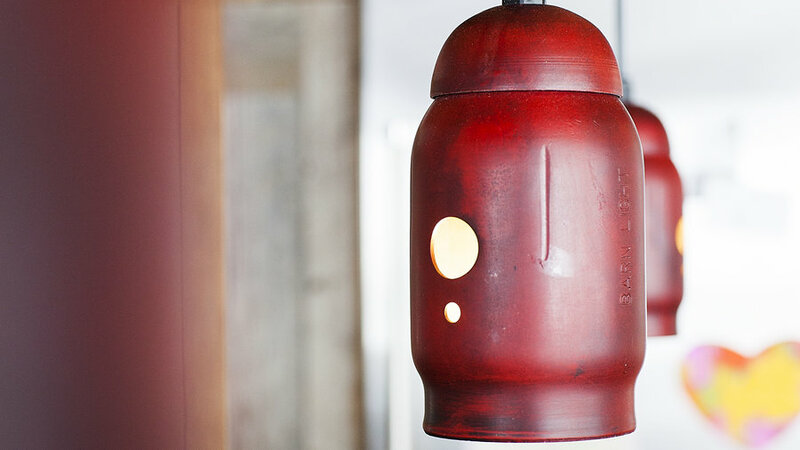 Specializing in vintage-style industrial lighting, Barn Light Electric also offers charming pendants made from recycled fuel tank tops and from mason jars. .
“L.L. 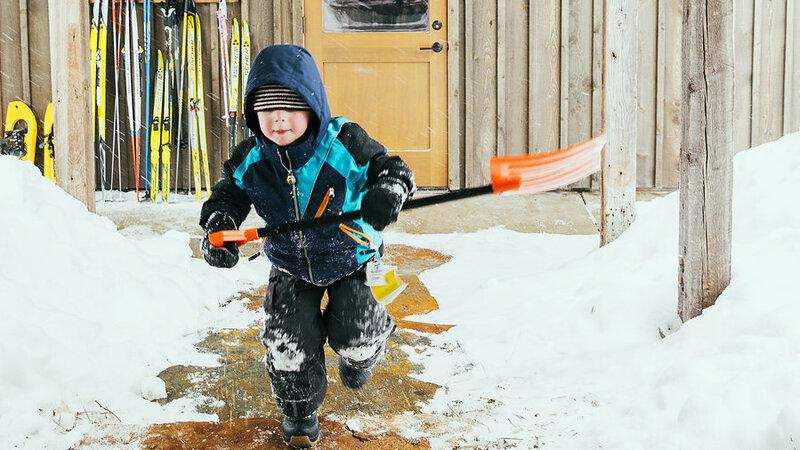 Bean’s braided wool rugs are so sturdy,” says Jen. “My grandmother had hers for 50 years.” Plus, they come in a huge variety of colors and shapes. . 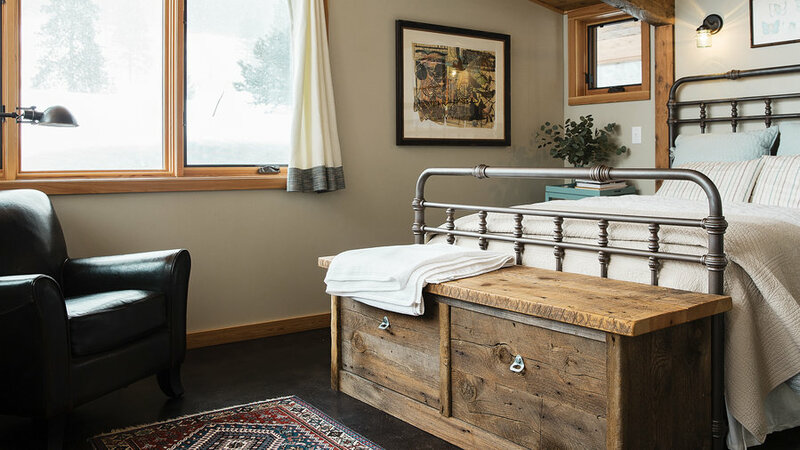 In this relatively small room, the couple kept it simple, with a reproduction cast-iron bed and a custom chest by local Cliff Schwab of Winthrop Wood Works. The bed is The American Cast Iron Bed Company’s Laredo model in the aged iron finish (the company has 36 finish options). .
One of Jen’s favorite spaces in the house is the master bathroom. “It’s very peaceful,” she says. The walls are covered in whitewashed reclaimed wood and corrugated metal wainscoting. 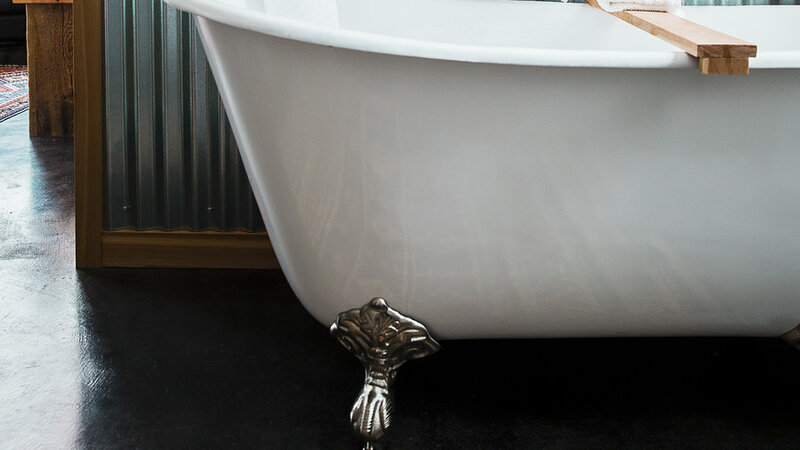 Jen found her ultimate bathtub, the Callaway slipper tub with ball and claw feet, at Signature Hardware. The company also offers Japanese soaking tubs and outdoor showers. . 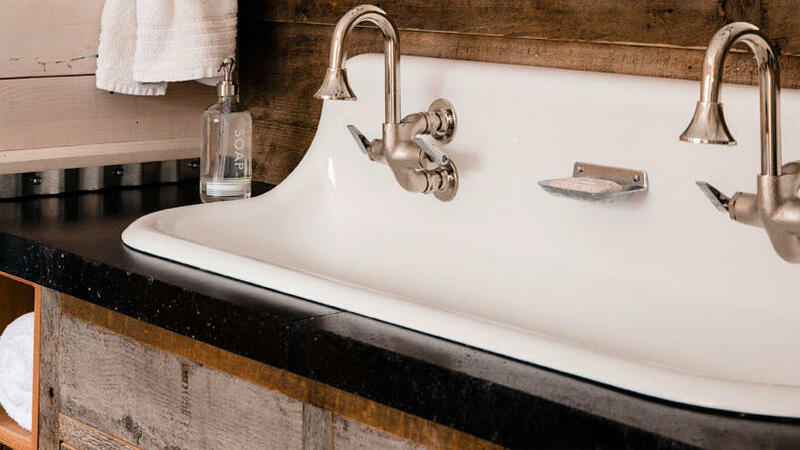 In the master bathroom, a trough sink and rough wood textures contrast the industrial style of the twin faucets. 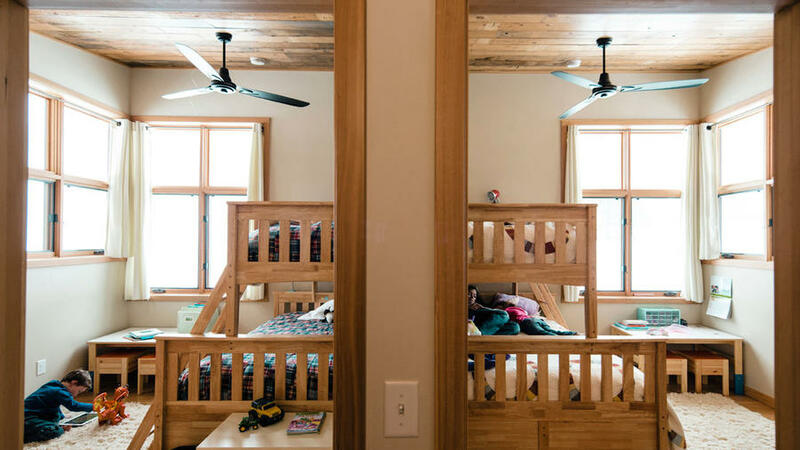 The children’s small bedrooms are symmetrical and furnished identically with bunkbeds from Underhill’s, a small store in the Seattle area. Salvage wood ceilings bring character into the simple spaces.